CHESTERMERE – Long before Chestermere was even a town, a group of men in the area decided to form a club where they could socialize. So, in 1945, L. Timmins introduced the sport of curling to the area by forming the Chestermere Men’s Club. The group rented ice at the old Calgary Arena, and then at the Glencoe Club. In 1953, the club moved to the brand new Calgary Curling Club. They officially incorporated under the name of the Chestermere Men’s Club on April 30, 1956. In 1959, the group started curling out of the Big Four Building near downtown Calgary. At the time it was a facility that held a Guinness World Record for having the most sheets of curling ice under one roof, with a total of 48 sheets. On December 13, 1985 the Chestermere Men’s Club changed its name to the Chestermere Curling Association, led by the then-president, Merv Goodman. 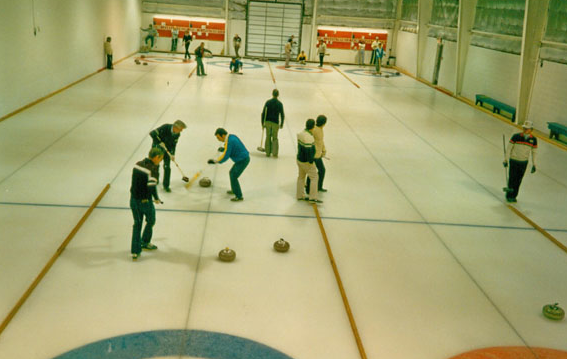 The club curled out of the rink in Indus for the ’85/’86 season, with construction on the Chestermere Curling Rink starting in January of 1986. The new rink opened its doors in November of 1986, and rocks were rented from Beiseker and Indus for that season. The grand opening was held the following year on November 21, 1987. The club boasted 148 members during the ’87/’88 curling season, and in April of ’88 they purchased the rocks they had been renting. During the summer of 1989, the rocks were sent to Winnipeg, Manitoba to have them resurfaced to improve their condition. In 2001, the original set of 64 stones were sent to London, Ontario where they had Blue Hone Inserts installed. 10 years later, in the summer of 2011, they were sent back to Ontario to have the granite inserts reconditioned as well the strikebands re-profiled. There have been five 8-enders recorded at the Chestermere, happening in 1990, 2001, and 2007 along with two in the 2010/2011 curling season. The presidents of Chestermere Curling Club from 1985 until 2011 are as follows: Merv Goodman, Jim Tatomir, Bryce Goodman, Ken Hunt, Hugh Adams, Larry Graves, Gordon Couldwell, Gerd Springer, Marla Forth, Bob Johnson, Ken Hunt (for a second term) and presently Randy Palaniuk. In 2000, three sets of CANCURL junior stones were purchased with a lottery board grant and supplemented by Chestermere Curling Association monies. These light weight stones allow children as young as seven to take part in the game of curling. In 2001, the junior program became official under the guidance of junior curling coordinator Marla Forth. Upwards of 60 junior curlers now utilize two draw times on Sunday afternoons from January through March. 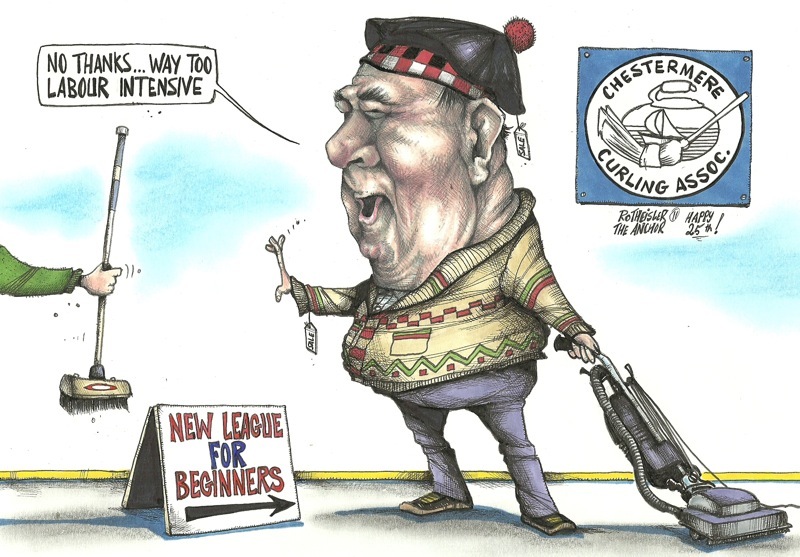 Today, the club has over 250 members, with many of them curling more than once a week. Currently they are near capacity curling with two draws nightly, five nights a week. The juniors curl on Sunday afternoons, and the seniors have a very active curling league which runs every Thursday morning. The club hosts three open bonspiels every year. In January, they host the Mixed spiel, which they have been co-hosting with Indus Bow Valley Curling Club for the past three years. The Men’s bonspiel now takes place in November, and the Ladies bonspiel takes place in March. John Morris, who is a Chestermere firefighter and local resident put a team in our Men’s Bonspiel in 2007 and took first place in the “B” event. Morris holds a Gold Medal in Men’s Curling from the 2010 Vancouver Winter Olympics. Curling in Chestermere has always been strong and a wonderful social outing. Members say that it’s a great way to get to know your community members, and that many strong and lasting friendships have come out of the club. Three present members of the Chestermere Curling Association have been enjoying the comradery on the ice for the past 25 years; they are Hugh Adams, Sylvia Adams and Barry Wakeford.